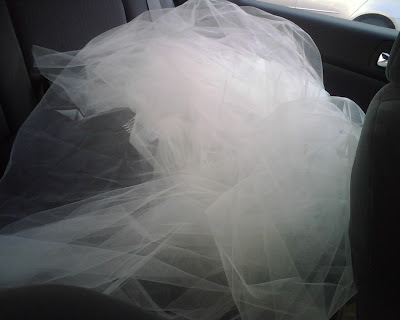 i heart peonies: i bought my veil! Heehee. I bought her off of a fellow Chicago bride. She enjoyed the car ride home in the back of my Honda. She is cathedral length, ivory (a really beautiful shade, actually), custom made from Priscilla of Boston and it was about half of what I budgeted for it. Very, very simple but she looks gorgeous over my dress. Here are some pictures of the original owner, looking fabulous in it. She is actually wearing two veils here, and I only purchased the cathedral one. So pretty! I like the way the veil transformed from "it" to "she" in the course of one paragraph.